In 1969, the world was changing. Neil Armstrong was the first man to step foot on the moon and David Bowie released the album Space Oddity. The Mini also had to change and the Mark III model was released in October 1969. There were changes to the bodyshell, including larger doors with concealed hinges, and winding windows replaced the old fashioned slider type. There were also changes to the suspension, reverting from hydrolastic to rubber cones to reduce manufacturing costs. Although the Mini was still popular in the UK, it was appearing increasingly outdated when compared to other cars. However, it remained the only car of its size in the market. In 1990, there was suddenly renewed interest in the Mark II Mini when the popular TV show, Mr Bean was released. the lead character, Mr Bean, played by car enthusiast Rowan Atkinson, drove a yellow model of the Mini Mark III, performing stunts that demonstrating the compact nature of the car. He even appeared at the Goodwood Revival in 2009. 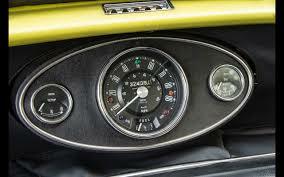 The dashboard of the new Mini had limited modifications, with a centrally located speedometer, and fuel and temperature gauges mounted either side. The design was simple and reflected the minimalist thinking. Smiths continue to manufacture gauges for the Mark III Mini including the digital replacement dashboard fit 90mph speedo. The new model has a larger OLED panel for odo or trip readout, onboard "drive-to-set" programming, billet case and fuel gauge programmable for different sender characteristics, as well as LED warning lights. The speedo is also available in a magnolia finish with KMH or MPH variants up to speeds of 130 MPH (200 KMH ). A Mini Cooper variant will also be released soon, which will have the original dial with concentric rings and a raised centre dial without the top warning light.